With so many different air “purifiers” available for a vast range of prices, it may be difficult to decipher what is worthwhile and what is, well, worthless. It can be tempting to settle for an inexpensive air purifier, especially when it is promoted with jargon and promises. When we settle for a cheap air “purifier,” what are we actually settling for? But, when we settle for a cheap air “purifier,” what are we actually settling for? Depending on the type of technology implemented, an air purifier can tremendously improve air quality, make little or no difference in the air quality, or make the air quality worse. It’s important to note that different filtration technologies are required for removing particles versus what is needed to filter gases and chemicals. Synthetic air filters use a charged media comprising synthetic fibers with an electrical charge to increase the “stickiness” of the filter. Synthetic filter efficiency dramatically decreases as the filter becomes overloaded with particles. These fibers lose their charge over time, as particles “stick” to the filter and the filter becomes too “loaded.” In fact, the efficiency dramatically decreases as the filter becomes “overloaded” with particles, and the stickiness is reduced. Electronic air purifiers use electrostatic attraction to trap particles. Ionizers generate ions that attach to airborne pollution particles, giving them a charge. The charge causes the particles to attach to nearby surfaces, such as a collecting plate in the device or to nearby walls or furniture. Even air purifiers that combine ionizers with filters or air cleaning “plates” can release thousands of charged particles into a room. Ion-generating air purifiers can increase the risk of particles being deposited into your lungs. The U.S. EPA (Environmental Protection Agency) warns that ion-generating air purifiers can increase the risk of particles being deposited into your lungs. Ion-generating machines can also produce ozone as a byproduct. Similar to electronic air cleaners, ionizers (also called ion generators) use charged ions to clean air. However, where electronic air cleaners include collector plates, ionizers simply send charged ions into the air. Ionizers simply send charged ions into the air. These ions make the air “sticky,” meaning the ions attach to airborne particles so they become charged. This charge causes the particles to combine with larger particles and become too heavy to remain airborne. These particles can stick to nearby surface areas such as walls and furniture – including your lungs. These devices use both ionization and synthetic filters. First, hybrid air purifiers ionize airborne pollution particles. Then, the ionized, “charged” particles pass through a filter and “stick” to fibers in the filter.However, the above warnings about ionized particles still apply. Some air cleaners use ultraviolet (UV) light technology to irradiate indoor pollutants, although UV does not remove pollutants from the air. Bacteria and mould spores are often resistant to UV radiation. Ultraviolet germicidal irradiation (UVGI) is intended to irradiate viruses, bacteria and mould spores. This process is supposed to kill the “germ” and leave the particle airborne. However, bacteria and mould spores are often resistant to UV radiation. Even if these contaminants are “killed,” because they are not filtered, they can still be deposited in the lungs or other parts of the body. This is due to the fact that UV does not remove particles from the air. Mechanical air filtration technology is proven to significantly reduce airborne particles from indoor environments. Mechanical technology uses a mesh filter typically woven of glass or specialty synthetic fibers to trap airborne particles. As air passes through the filter, large particles are caught when they can’t fit through the openings in the fibers. Small particles attach to the mesh material through interception (particles stick to a fiber), impaction, and diffusion. Mechanical filtration is the safest and most effective method for the removal of airborne particles. High Efficiency Particulate Air (HEPA) and HyperHEPA filters are in this category. Mechanical filtration is the safest and most effective method for the removal of airborne particles. The acronym “HEPA” stands for High Efficiency Particulate Air, a type of air filter that was originally designed in the 1940s to protect workers developing the atomic bomb. The filter was designed to control tiny particles that had become contaminated by radiation. HEPA filters work in mechanical air purifiers and are made with randomly arranged micro-glass fibers. As defined by the U.S. government, HEPA filters must remove a minimum of 99.97% of particles that are more than 0.3 microns in diameter to qualify as HEPA. Therefore, “HEPA” refers to both a type of filter technology as well as an efficiency standard. No independent body is required to test or verify the HEPA claim. Due to its high efficiency, reliability and proven track-record, HEPA technology has become the industry standard for particulate filtration in critical environments, such as laboratories and hospital operating rooms. Most so-called HEPA filters are never tested! However, there is no requirement that household air purifiers are tested to meet HEPA standards. Recognizing the great marketing potential of the term "HEPA," many manufacturers use the term “HEPA” to project a high-performance image onto their room air purifiers. The problem is there is that there are no regulations regarding the use of “HEPA” in testing and labeling products. In other words, no independent body is required to test or verify the HEPA claim. Thus, most so-called “HEPA” filters are never tested! Many manufacturers use the term “HEPA” to project a high-performance image onto their room air purifiers. To confuse consumers further, there are more and more types of HEPA claims entering the market. “True HEPA,” HEPA-type,” “HEPA-like,” “HEPA-style,” “99% HEPA” and “HEPAsilent” are some of the HEPA claims consumers are faced with deciphering. To summarize, true HEPA refers to HEPA filters that claim to capture 99.97% of particles down to 0.3 microns. “True HEPA” is a marketing term designed to assure customers that their HEPA filters actually stand up to HEPA standards. The use of this term is also not regulated. HEPA filters are somewhat fragile, so there’s no guarantee a filter that passes HEPA standards will perform after manufacturing. There are no regulations regarding the use of “HEPA” in testing and labeling products. HEPA-type, HEPA-like, HEPA-style, 99% HEPA and HEPASilent are all subpar versions of what truly constitutes a HEPA air filter and may never have been tested. Aside from doing your own testing, there’s no way to know how efficient – or inefficient – a filter using one of these terms is. Aside from doing your own testing, there’s no way to know how efficient – or inefficient – a filter using one of these terms is. Some so-called HEPA filters are made of ordinary synthetic fibers. Synthetic fiber media is a far less dense structure and is much less efficient at trapping particles than media made of fiberglass or specialty synthetic fibers. Other filters trying to be passed off as HEPA use electrostatic particle charging, or ionization. The efficiency of many air purifiers often decreases by even 50% in just a few months. Technologies using ionization should be avoided because charged particles can pose a health threat. Also, particle-charging causes a trapping plate to quickly become “loaded,” and the air purifier efficiency often decreases by even 50% in just a few months. Is “True HEPA” truly the gold standard? The best-case scenario for filters that actually do achieve the HEPA standard is to filter particles down to 0.3 microns at 99.97% efficiency. Airborne particles are categorized into three sizes: coarse, fine, and ultrafine. The smallest particles – ultrafine – are the most abundant (90% of all airborne particles) and the most dangerous. The best-case scenario for filters that actually do achieve the HEPA standard is to filter particles down to 0.3 microns. Ultrafine particles range from 0.1 microns all the way down to 0.003 particles – the tiniest that exist. Ultrafine particles are so small that, once inhaled, move straight through the lung tissue and directly into the bloodstream. These dangerous particles then are carried with the blood to where ever it travels, including all major organs – even the brain! The smallest particles – ultrafines (smaller than 0.1 micron) – are the most abundant (90% of all airborne particles) and the most dangerous. Why does the air purifier industry tout that filtering PM2.5, fine particles between 0.3 to 2.5 microns in diameter, is the gold standard of air purification? Why do so many manufacturers try to mislead the public into believing their filters can actually achieve a standard that doesn’t even begin to touch the smallest, most abundant, and most dangerous particles – ultrafines? Why does the air purifier industry tout that filtering PM2.5 is the gold standard of air purification? There is one air purification company that has managed to solve the reliable performance problem. 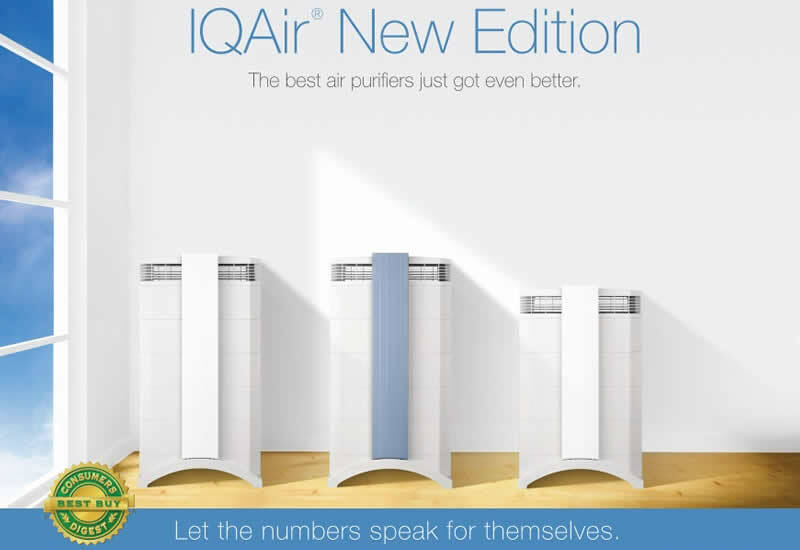 IQAir’s patented HyperHEPA filtration technology is able to filter the dangerous and highly abundant ultrafine particles all the way down to 0.003 microns – that’s ten times smaller than a virus and 100 times smaller than a HEPA filter in the best scenario. IQAir’s HyperHEPA filtration is tested and certified by an independent, third-party laboratory to ensure it is effectively filtering ultrafine particles down to 0.003 microns. Unlike solid particles, the atoms and molecules that make up gases are in a gaseous physical state and can move about at high speeds. They are also smaller in diameter than particulates. In fact, the average diameter is less than 0.001 microns.8 The technology needed in an air purifier designed to remove gases and chemicals is entirely different than the technology needed to filter particulates. The technology needed to remove gases and chemicals is different than what’s needed to filter particulates. There are two main processes that remove gaseous pollutants: adsorption and chemisorption. It’s helpful to know that “sorption” refers to a process of one substance becoming attached to another, and a “sorbent” is a substance that can collect molecules through sorption. Adsorption is a process in which atoms or molecules adhere to the surface of the material known as an adsorbent (whereas absorption is the absorbing of molecules by a liquid or a gas)i.e. the adsorbent and the gas are physically bound together. The amount of gases the adsorbent can collect is a certain percentage of adsorbent weight, depending on the specific gas being filtered. Chemisorption occurs when gas or vapour molecules chemically react with a sorbent material or with reactive agents impregnated into the sorbent. This process occurs on the surface of the chemical sorbent and there is no adsorption that takes place. The chemical reaction leaves water and oxygen as airborne byproducts. Ozone-generators are a category of air cleaners that deliberately produce ozone as the primary cleaning mechanism. Ozone is a reactive gas comprising three oxygen atoms and is a primary component of smog. The EPA states that, when used at levels that are not dangerous, ozone has little potential to remove air pollutants. Inhaled ozone can irritate the lining of the respiratory system, causing coughing, chest tightness and shortness of breath. Long-term exposure can cause or worsen asthma and even lead to premature death. In fact, ozone generators are illegal in California. Photocatalytic oxidation (PCO): PCO technology uses UV lamps and a catalyst (a substance that causes a reaction) that reacts with the light. The most common catalyst used in PCO devices is titanium oxide. These cleaners are designed to destroy gaseous pollutants by changing them into harmless byproducts. When using titanium oxide as the catalyst, PCO devices are supposed to convert harmful gases into carbon dioxide (CO2) and water. A common misconception about PCO is that they are more effective than activated carbon or other solid gas filters. However, the EPA states that currently available catalysts are ineffective against harmful gases. Also, PCO devices can produce harmful ozone as a byproduct. Zeolite is a “filler” that is substantially less expensive than activated carbon. Many room air purifiers that use activated carbon also use zeolite. In fact, there is no reliable scientific evidence to show that zeolite is able to remove any gaseous compound better than specialty impregnated carbons. Zeolite is a “filler” that is substantially less expensive than activated carbon. There are two primary types of activated carbon used in air purification: coconut shell and coal-based. Coconut-shell activated carbon is low-grade, inexpensive and widely available. Some allergy sufferers have reported being allergic to dust from coconut shell carbon. It is also very soft and tends to generate dust during transport and sometimes even during usage. When compared with coal-based activated carbon, coconut shell carbon has fewer micropores. When compared with coal-based activated carbon, coconut shell carbon has fewer micropores, which are needed to remove odors and chemicals in concentrations common to the home environment. What does work for adsorption? Coal-based activated carbon has an incredibly large internal surface area and is a more effective adsorbent than activated carbon made from coconut shells. Of the four major coal types (sub-bituminous, bituminous, lignite, anthracite), bituminous coal has the widest range of carbon content. For these reasons, IQAir chooses bituminous coal-based activated carbon for adsorption. While higher degrees of activation increases the adsorbent capacity of the activated carbon at very high pollution concentrations, it actually decreases its effectiveness to remove odors and chemicals at the typical concentrations found in the home environment. This is because the higher the activation degree of the carbon, the larger the pores. However, it’s only the tiny micropores that are capable of removing odors and chemicals in concentrations typically found in homes. IQAir uses activated carbon that is activated in a way to preserve a maximum amount of micropores for best possible gas and odour control. The effectiveness of an adsorbent may be enhanced when impregnated with chemical catalysts. It can be tempting to go with a cheap air purifier, especially when the marketing jargon is so confusing (and effective). But, isn’t the health of you and your family worth the investment?